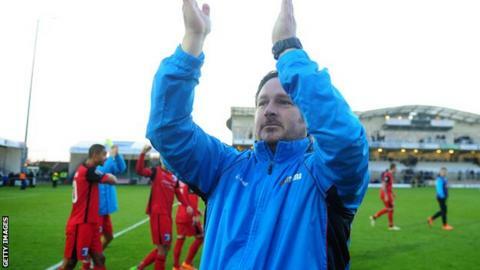 National League club Barrow have announced the departure of manager Paul Cox after nearly two years in charge. A club statement on Thursday said they had "mutually agreed to his resignation in the interests of both parties". It comes after just five league matches of the 2017-18 season, of which Barrow won one, drew three and lost one. Michael Moore will take interim charge while the Bluebirds search for a successor to 45-year-old former Mansfield and Torquay boss Cox. In May, Barrow gave fellow National League club Hartlepool United permission to speak to Cox, before Pools appointed The New Saints boss Craig Harrison. Cox had arrived on a three-and-a-half-year deal in November 2015 following Darren Edmondson's exit by mutual consent. An 11th-place finish followed in 2015-16, before a seventh-place finish last term. Barrow's statement added: "His efforts have made the club more professional both on and off the pitch. We wish him the best of luck in the next step of his career."